Shane Barber knows a thing or two about restaurants. He opened Bandits Grill & Bar here and in California and was instrumental in helping to create MidiCi The Neapolitan Pizza Company – founded in California – consulting on the restaurant’s food and drink menus. 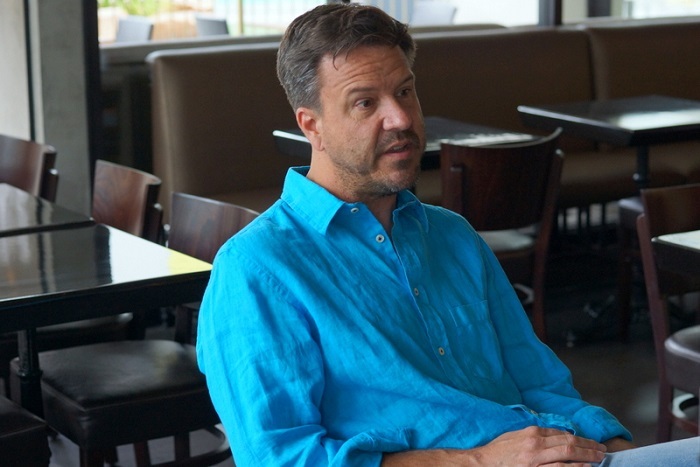 Now, in partnership with Marc Crossman and Kathryn Conroy, he has a locally-owned MidiCi of his own. And, wow – what an eye-popper! It’s one of the first signs of The Gateway’s much-heralded impending “comeback.” If MidiCi is any indication, the once beleaguered shopping center will soon be rockin’. MidiCi is a walk-up-to-the-counter-and-order establishment that looks like anything but. After first surveying an array of menu items from a glassed-in display, customers place orders with a staff member at a computer terminal and the food is delivered to their table. But don’t get the idea that the atmosphere is that of a Chipotle or other such fast and informal establishment, because the restaurant looks like a million bucks (and, I suspect it cost more than that to build). It’s a gorgeous, large and airy space with high ceilings that was designed by acclaimed hotel and restaurant architect and designer Sam Marshall. 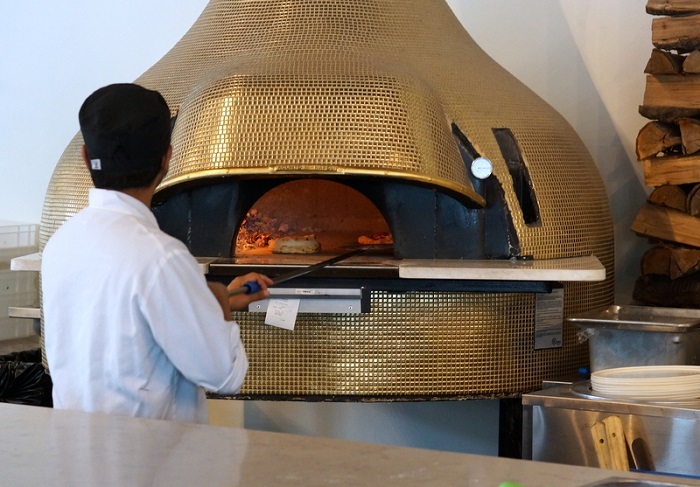 Yet while the prices are very reasonable – a mere $8.45 for a wood-oven cooked Margherita pizza, for example – the feel and look of MidiCi is quite posh. 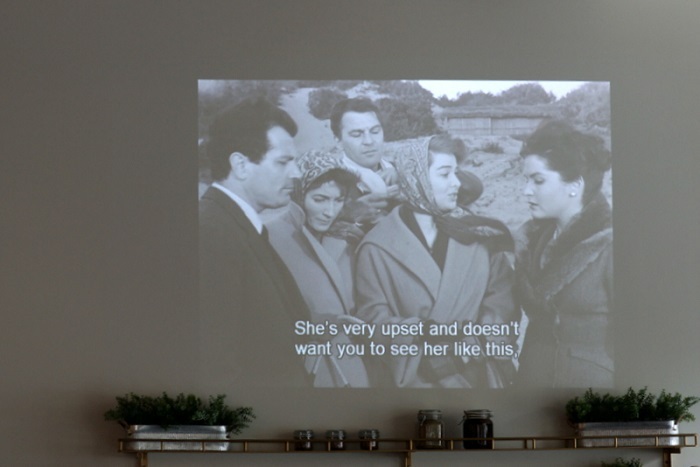 On a back wall, subtitled black-and-white Italian films are projected. To be honest, now that MidiCi is here, I feel a bit sorry for the California Pizza Kitchen eatery just across from it. 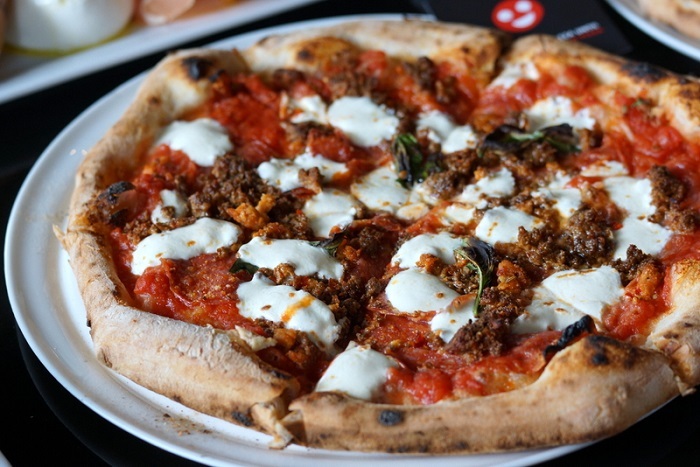 MidiCi is the type of place you’ll want to linger, although service is quite rapid – pizzas cook in as little as 90 seconds. Anyway, I recommend trying some of the small or “shared” plates. My favorite has to be the homemade meatballs (2/$6.45 or 4/$10.45). 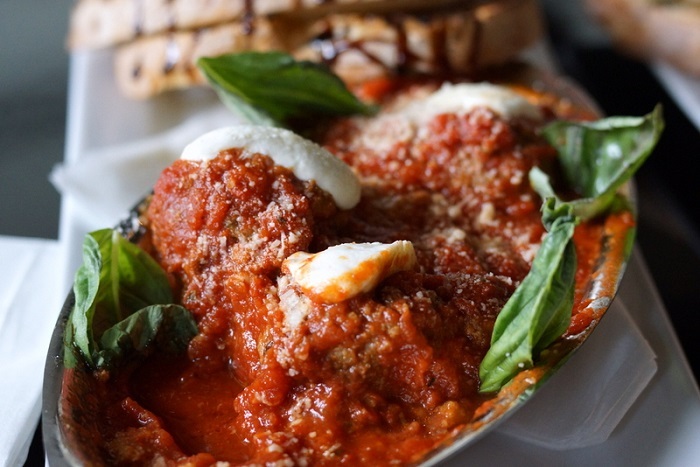 These are jumbo-size meatballs made with Angus beef, topped with fresh Italian marinara sauce, fresh mozzarella, basil leaves, and served with rustic grilled bread (also baked in-house) alongside. 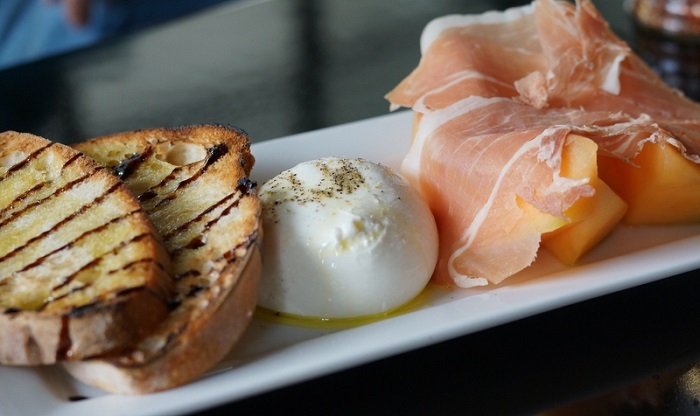 Equally appealing is Burrata with Melon & Prosciutto ($9.95). It’s a big, delicate ball of burrata cheese served with fresh cantaloupe, a generous portion of thin-sliced prosciutto, and drizzled with extra-virgin olive oil and a sprinkle of black pepper. Grilled bread hit with balsamic vinegar comes with the burrata and melon, as well. For those who love classics, MidiCi also offers Garlic Bread ($3.95) with fresh garlic, parsley, Parmesan and olive oil. Those who’ve followed my food writing through the years know that I am an unrepentant pizza snob. Although I love many types of pizza – from NYC and New Haven style to Chicago and even gourmet California varieties – my very favorite is Neapolitan. Especially AVPN-certified pizzas. For those who might need a refresher, AVPN stands for Associazione Verace Pizza Napoletana. It’s an Italian organization that certifies worthy pizzerias in that country, making pizzas cooked strictly with dough made from only four ingredients: water, salt, yeast and flour. The latter must be 00 or 0 type flour. 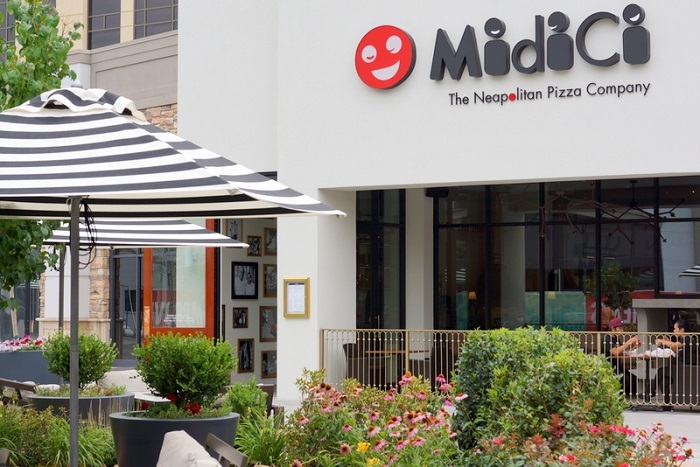 In this country VPN Americas does the pizza certifications for the AVPN, and I’d be surprised if MidiCi doesn’t quickly gain a prestigious certification from them. Currently, the only Utah pizzeria to have been given VPN status is Settebello. 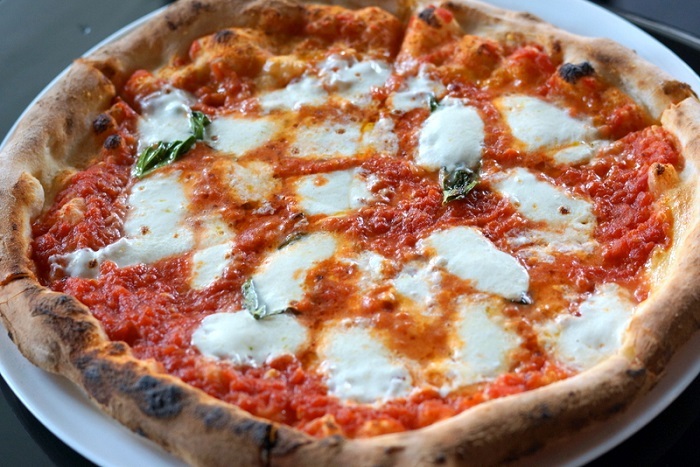 The pizzas at MidiCi are made adhering to AVPN guidelines and the best way to taste a true Neapolitan-style pizza is the simplest: start with a Margherita pizza. MidiCi’s Margheritas are among the best I’ve eaten anywhere, made with sauce from Italian tomatoes and topped with fresh mozzarella, basil, and a sprinkling of olive oil. Quite simply, it’s pizza perfection. But alas, man cannot live on Margherita pizza alone. Although you might be tempted to, especially on Margherita Tuesdays when the Margherita pizzas at MidiCi are priced at a mere 5 bucks. So for those who might want to deviate from red sauce, MidiCi offers a white Neapolitan-style pizza, sans tomato sauce, as well as a really delicious chicken pesto pizza ($11.45). 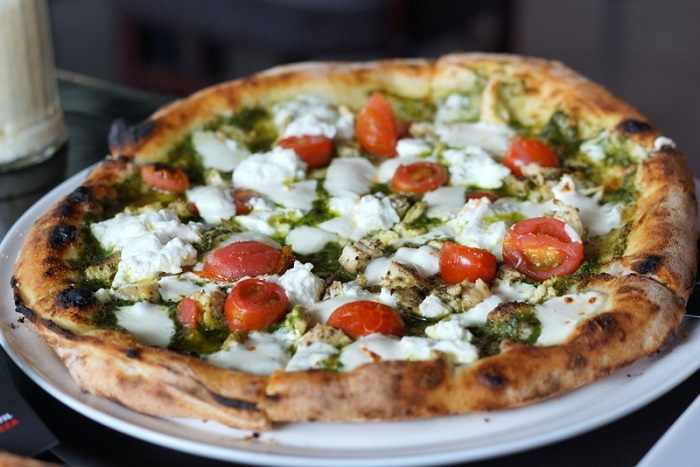 The pizza dough is covered with a thin layer of housemade basil pesto, fresh mozzarella and ricotta cheeses, grape tomatoes, and very flavorful chicken chunks. It’s a pizza I’d happily eat again and again. That goes double for the zippy pizza called The Devil’s ($11.45). If you like spicy stuff like I do, you’re gonna love The Devil’s. It begins traditionally enough, with Italian tomato sauce and fresh mozzarella, but then veers towards incendiary with spicy housemade Italian sauce, spicy Italian salami and, if that’s not spicy enough, red chilies, to boot. I loved every heat-seeking bite. Maybe you’re trying to cut down on carbs. If so, or if you’re just looking for something light and healthy, MidiCi has you covered, too. 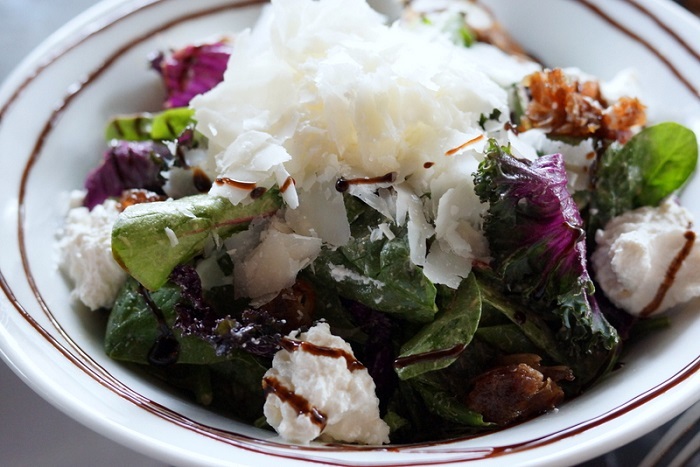 There’s a luscious Purple Kale & Ricotta salad ($8.45) on the menu that’s gluten-free. It’s big, generous bowl of baby spinach, purple kale, dates, ricotta and Parmigiano-Reggiano cheeses, with a mustard-vinaigrette dressing. There’s also a house salad available, along with Greek salad, Italian salad, Caesar, and an irresistible walnut & Gorgonzola salad (also gluten-free). While dining at MidiCi, my companions and I all agreed that everything is better with Nutella. Sammy, who loves Nutella as much as I do, came up with the idea of basically rating everything on a Nutella scale. You might have a good day. You might have a great day. But what you really want, is a Nutella day! And, what you also want is the ridiculously decadent signature MidiCi Nutella Calzone ($6.45). 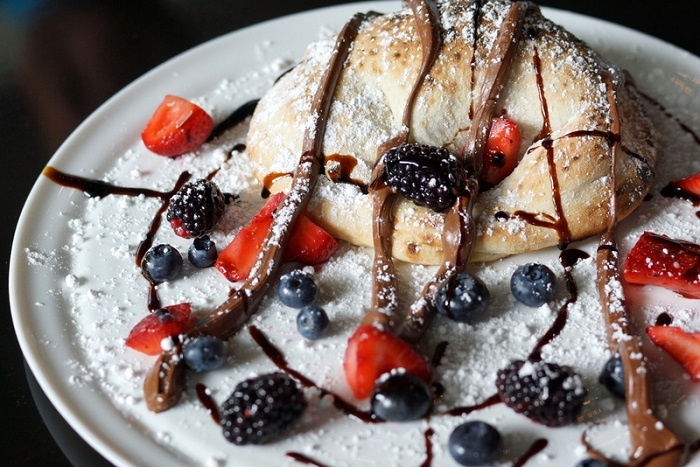 It’s a dessert calzone, baked to crisp perfection and sprinkled with powdered sugar, fresh fruits (blackberries, strawberries and blueberries), then drizzled with a sweet and tart balsamic reduction and, yes … Nutella! OMG this is one of the best desserts ever. If it weren’t so tasty, I’d have just smeared it all over my body. There are more good things coming soon to The Gateway, including a new “restaurant row.” But the best is already here: MidiCi. Run, don’t walk, to get in on the action before the crowds hit, that’s my best advice.